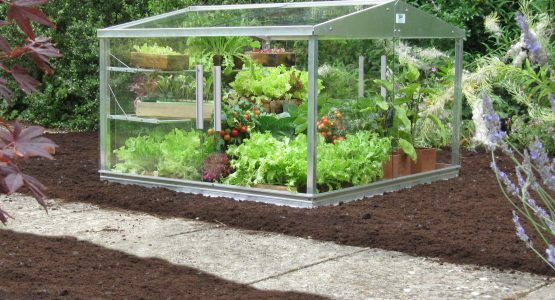 The Access Cold Frame has a wide variety of uses: bringing on early vegetables; hardening off young plants and providing protection for plants such as Alpines. Access Cold Frames have a number of unique benefits. The company was named ‘Access’ in 1958 as the Cold Frames have a unique sliding panel arrangement which makes access into the Cold Frame very easy. Many rival models have lifting tops, which must be held up to gain access, so all work must then be done with just one hand! With an Access Cold Frame, the roof and the side panels simply slide, making access quick and easy. If more access is required, the panels themselves will simply lift out, allowing unimpeded access into the Cold Frame. All of the panels are removable. Not only does this make cleaning and moving the Cold Frame easy, but it also creates great flexibility. In late Spring the roof panels can be removed, allowing taller plants to grow out through the roof, and rain to enter the frame. By leaving all of the sides on the plants are given wind protection and the soil is kept much warmer. For Alpines the process is reversed, with the tops being left on for rain protection, and the side glass partially or completely removed. As the Cold Frame is glazed in toughened safety glass, fully glazed it is very heavy. This ensures that in strong winds it will not blow away, even on the coast. The sliding panel arrangement also ensures there are no hinged lids to bang up and down in the wind. The Cold Frames are also designed to cope with snow. We sell many models up into the north of England and the Scottish Highlands – we just recommend that the snow is swept off once it has reached about 2′ 6″ (0.75m) depth. Not only is the framework very strong, it also comes with a 25 year framework guarantee. Access have been making the Cold Frames in aluminium since 1977 (our original models were in galvanised steel), and our original prototype is still going strong 35 years later. The sliding panel design has another advantage – the panels can also be slid for ventilation. On a cool day, the doors can be left open just and inch or so, allowing gentle air movement inside and preventing disease problems associated with moist, stagnant air. When the weather becomes warmer, most Cold Frames have problems keeping the temperatures down, but not the Access Cold Frame. The the side and roof panels can be slid wide open, giving a huge ventilation area. Even in the height of Summer the Cold Frame temperatures can be effectively controlled. For delicate plants optional shading can also be added. Although the glass makes the frame very heavy, once the glass has been removed the aluminium framework can easily be lifted out off the bed. This allows the earth to be properly dug over or frame to be moved from place to place. The framework itself features a deep aluminium base section, so the Cold Frame does not need any special base. It can be placed onto any reasonably level surface – even freshly dug earth. Glass is still the best glazing material. It is strong, rigid and has excellent light transmission. Plastics and acrylics, by contrast, scratch easily, attract the dirt and degrade in the sunlight. When the wind blows, the plastic sheets will bend and blow out. If it snows they will bend and fall in. All of our Cold Frames are glazed using toughened safety glass. The toughening process does two things: it makes the glass stronger – around 5 times stronger than traditional glass sheets; and it makes it break safely into thousands of tiny fragments – just like a car window. This means it is safe to use, even with pets and children. Our wide range of accessories makes the Cold Frame even more versatile. For bringing-in or hardening-off seedlings we have sets of seed tray shelves. Each set will hold up to 8 full sized seed trays. The shelves can be easily removed in the Summer when no longer required. For shade loving plants, or young plants that are being grown later in the season, we have shading which will clip onto the roof of the Cold Frame. Louvre vents are also available: automatic vents will open and close for unattended ventilation; or for a permanently baffled air flow for plants such as Alpines, we provide manually adjustable louvre vents. For watering the Cold Frame, a mist watering line can be fitted up into the apex of the Cold Frame, with gentle mist nozzles providing watering over the entire frame.